Raúl Cubas was a detained/disappeared in the ESMA. His captors made him interview the National Team coach, Cesar Luis Menotti. This is the story of that strange experience. When I think about the ’78 World Cup, a confused turmoil of feelings and memories as a militant and as a football fan passes through my head. On one hand, I´ve been a witness and a victim of the repressive strategies of the Navy; on the other hand, I was a football fan who followed the performance of the National Team. I lived with guilt. As a militant, I wanted that Argentina didn´t win the World Cup because I thought it would be a "victory" that would serve the political purposes of the dictatorship to perpetuate itself in power. But as a fan I couldn´t hide the joy when I knew Argentina won, or when I heard the fan shouting that reach the ESMA form the Monumental stadium. 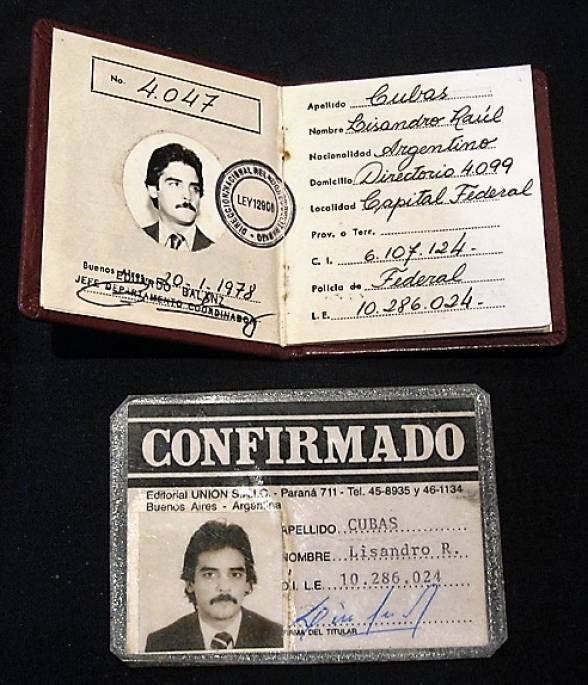 They detained me on October 20, 1976, at 8 o'clock in the morning, in La Matanza. Several people in civilian clothes, armed, whom I later identified as belonging to the ESMA, throw me to the floor and handcuffed me. That gave me time to ingest a cyanide pill to commit suicide. I didn´t make it. I remember that they put me in the trunk of a car, where I gradually lost consciousness. At the moment of death, you can watch all the important moments of your life as if you were watching a movie: the memory I have is of a feeling of tranquility. When I woke up I was hooded and handcuffed, lying on top of other bodies. I tried to play dead but after a while they realized I was alive. I was one of the detainees in La Pecera, the site built in the ESMA Clandestine Detention Center. There were offices, including a library, a daily dining room, the office of Lieutenant Juan Carlos Rolón, and also a press office and teleprinters. 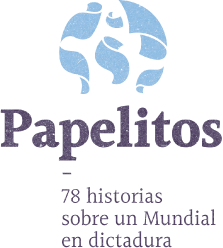 My job was to follow and analyze the news from some international agencies, specifically those that had to do with the image of Argentina abroad, that is, those referring to the denunciations of human rights violations, criticism of the dictatorship, etc. Later on, we began to write news for the daily newscast of the Argentine Foreign Broadcasting Network (RAE), also dependent on the Navy. In addition, we made reports for the Foreign Ministry Magazine, which was distributed to all embassies. A Raúl Cubas lo hicieron pasar por periodista y lo llevaron a entrevistar a Menotti. One day they came with the idea of ​​interviewing the coach of the National Team, César Luis Menotti. 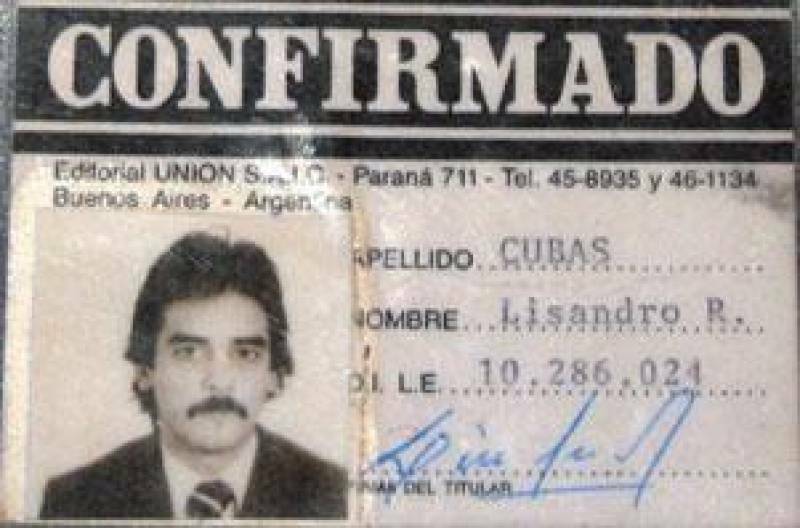 They proposed it to Rolón, who was the officer in charge of La Pecera, to counter the alleged “anti-Argentine campaign” abroad. It was necessary to convey that peace and security reigned in Argentina, that the World Cup organization didn´t have any kind of problems. Why did they choose me to go to the interview? For three things: I was the one that had more time in the press office, I knew a lot about football and I also had worked in 7 Días Magazine, although never as a journalist. That is how everything came about. I remember that they made me fake press credentials and bought me clothes: gabardine trousers, shirt, tie and a blue jacket, which I wear for the first time on the day of the interview. The day came. It was late in the afternoon in Ezeiza. In the morning I finished the details of the questionnaire. I had one premise: my goal was not to ask questions that would facilitate favorable responses to the military dictatorship; I mean, I was going to limit them to the purely sports talk. When I arrived at Ezeiza, always escorted by my captors, I was worried because in the surveillance of the entrance I recognized ESMA personnel who were in charge of custody. But the press conference continued without problems. Neither Rolón nor I asked questions. Then there was a dinner and, at the end, my turn came: I told Rolón that I wanted to do the interview alone because he made me nervous. Luckily he agreed. Then I went and faced Menotti. The moment of greatest nervousness was when I introduced myself as a media outlet of the Foreign Ministry. The technician didn´t understand that I was from a non-sport magazine, but I explained that it was a magazine widely read by compatriots who were abroad and demanded information about the World Cup. A thousand things crossed my mind. I thought about being able to generate trust to Menotti to be honest and tell him my situation in the ESMA. I also thought about telling them the names of the fellow prisoners who at that moment were detained/disappeared. 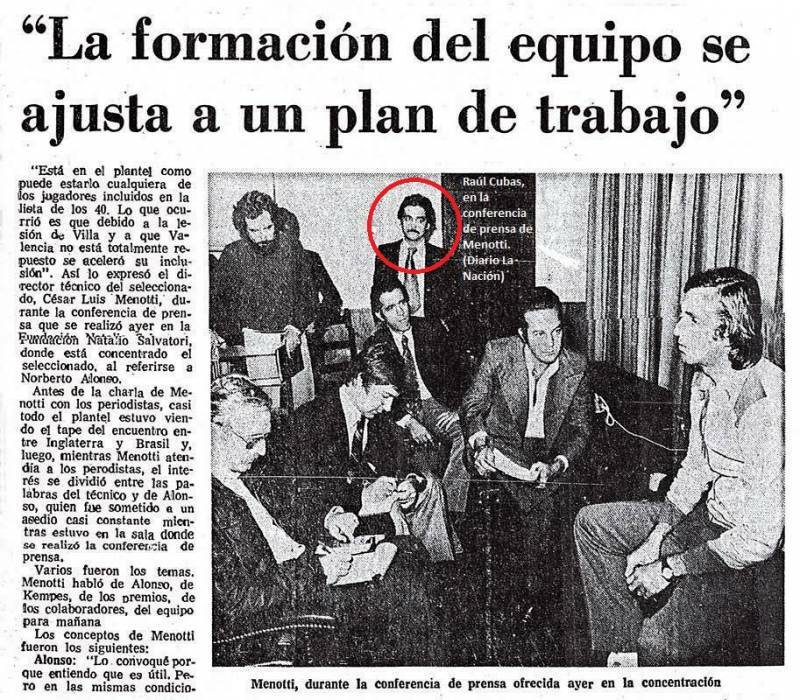 At that time, I didn´t have political trust in Menotti, for being a man linked to the left that have accepted that responsibility under a military dictatorship. I didn´t have the courage to do it either, I was afraid of his reaction to such a surreal situation, afraid of the consequences for my family. At the end of the interview I promised to send him a copy. I never knew if the Ministry sent it to him. A few years ago, I tried to get a copy in the Foreign Ministry, but they told me they didn´t have it.